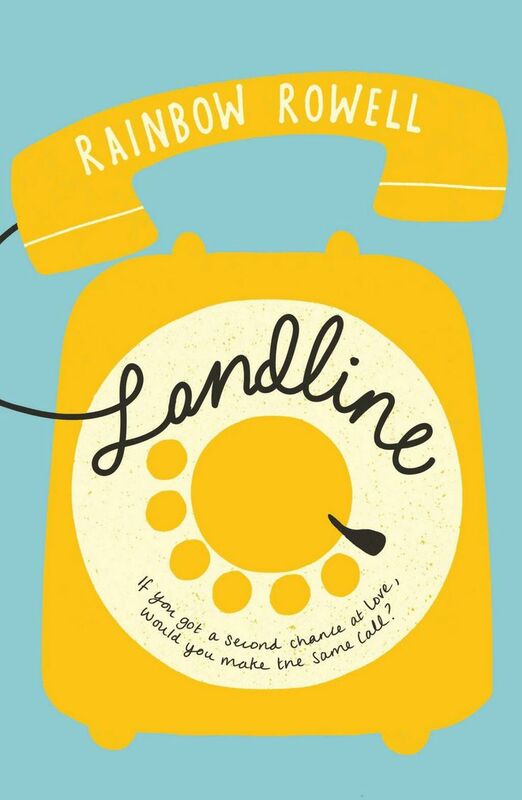 Landline is the second book by Rainbow Rowell I have read. Similar to The Shadow Hero, it really helped get me out of my reading rut, though Landline helped me more on the audiobook front. Landline is about Georgie McCool (yes, that's actually her name). Georgie is a writer on a comedy TV show - I imagine her as a less fashionable and social media savvy Mindy Kaling - and she's just gotten her big break. She and her best friend have been given the opportunity to write a pilot for their own show. HUGE! The only thing is, they have to work over Christmas to get the scripts ready, and Georgie is supposed to go to Omaha with her husband and daughters. She and her husband, Neil, have been going through a rocky patch recently (or for the entirety of their relationship, more or less), and Georgie knows this will be a tough conversation. It is, and Neil ends up taking their kids to Omaha while Georgie stays behind t work. And then, when Georgie tries to call, she can never get through to Neil. Or, at least, not to Neil now. She is able to use her mom's landline to reach Neil 15 years ago, just before he proposed marriage to her. The premise of mother as provider and father as nurturer is taken for granted and not even discussed, which I appreciate in that it normalizes the situation. I love that Georgie works and doesn't really spend a lot of time talking about how bad she feels that she doesn't drive her kids home from school; in fact, she barely talks about her daughters - this book is about her marriage, not about her entire family. However, this situation really is not quite natural for most people, and there's a lot of guilt on the mom's side, at least, and while that came out a bit subconsciously with all Georgie's comments about how great a father Neil is and how much his daughters love him (would these gushing comments ever be used to describe a stay-at-home mom, I wonder? ), I can't help but think that a lot of the tension in Georgie's marriage came from the fact that she worked long hours and her husband stayed at home, and as that was never dealt with, I felt like the story could have been a lot more. This was really hard for me to stomach. I didn't really believe that Neil sacrificed much at all. He didn't have any goals or ambitions in life except to be with Georgie (which he fully admitted and which is fine), whereas Georgie knew exactly what she wanted in life and went after it. So... what exactly did Neil sacrifice? Moving away from his beloved Omaha to live in hated Los Angeles? Fine, but given that he didn't have anything really pulling him in any other direction, it's hard to feel sorry for him. And what is with the whole premise of Neil always being on her side but she not always being on his side? I didn't see anything anywhere in which Georgie was not on Neil's side, too, so it bothered me that she felt that way. BUT, that's probably realistic, right? I mean, given Georgie's position as the working mom who probably already has guilt and other issues she's sorting through, she would probably make her husband out to be this fantastic man who deserves the world and herself to be some sort of pariah. AND just because he hasn't sacrificed his life's work to be with Georgie, that doesn't mean that Neil doesn't have any right to be unhappy, right? I mean, the guy has a right to his feelings. But that doesn't mean that he sacrificed so much more than she did. There is a lot of time spent talking about how Georgie has basically let herself go. I guess she's gained a lot of weight since having her kids, she wears old Metallica t-shirts, doesn't have any bras that fit her, and barely showers or changes her underwear. It's pretty gross. I suppose part of this is supposed to be grief that her husband and children are gone, but it comes off more as, "This woman doesn't even try any more." We are also told that Neil was overweight in college, with an almost double chin. But now that he is a stay-at-home dad, he has all this time to go biking around LA with his daughters and now he is LEAN and FIT and super-attractive. Everything about this situation bothered me. The lack of personal hygiene is very bothersome. The emphasis given to Georgie's appearance now vs previously and Neil's appearance now vs previously seems full of subtext. But isn't it understandable that a woman with a demanding job and a family at home would prioritize many things over the stationary bike. And isn't it reasonable that Georgie now feels a bit insecure, as Neil is the hot one in their relationship? Georgie's best friend is Seth, an amazingly good-looking and charming man whom she works with on their comedy shows. Applause to Rowell for having a man and women be such good friends through so much without any romantic tension. Oh, wait, there was romantic tension. Ok, fine, that's believable. You don't choose to spend the better part of 20 years of your life working with someone on your dream and vision for your life's work without maybe giving them a little bit of your heart. But wait, is Seth really Georgie's best friend? Because he didn't have much personality in the book. My guess would have been that Georgie's best friend was her half-sister. Ohmigosh, Georgie's half-sister. And her mom. Really, all the side characters in this book were fantastic. I loved them all (except Seth, who did not really come to life for me). So, I don't really know what to think of this book. I DO think it is a very true portrayal of what commitment really is - it's not all grand, romantic gestures and sweeping a person off their feet. It's making an active choice, every day, to choose the other person and take the good with the bad. I'm not in a marriage or a long-term relationship, but that felt very real to me. And the audiobook is SO well-done. If you like audiobooks and you like Rowell, I highly recommend trying her on audiobook. So a lot of points in this book's favor! But definitely many troubling points for me, too. My friend works and her husband stays at home, and she doesn't have much guilt about it. So I liked that that was the point of view here. Not every working mom with a SAHH has guilt abt being away from her kids. Plus, Neal wanted kids more than Georgie did, so, again, nice touch. What did bother me is how insufferable Neal was. He was SO ANNOYING. I was kind of actively rooting against them, so...you know. OMG, I had a lot of the same problems you did! I just reviewed this a few days ago, and it was ALL discussion questions. A lot of it came down to the fact that a lot of the external factors were left unplumbed, and a lot of things were said but not fleshed out--Seth isn't a threat to Neal, but maybe he is? I will say that most of Georgie's physical grossness seemed to me to be a product of her week of panic, not her whole current lifestyle. Maybe that's just what I caught, but I didn't feel like her aging body was made too much of. And I've known people who got divorced because of simple geography--she could NOT live with the winters, and he could not bear to leave New England--so I am maybe a bit more sympathetic to Neal for living somewhere he's unhappy, even if he didn't have a specific dream to follow. Though I do agree that if he was feeling so unfulfilled, that's not entirely Georgie's fault. I do think this is a book where one's feelings about work and relationships and parenting really come to the forefront in how you interpret the intricacies of their relationship. And that how the whole thing would look to you if you flipped the genders of the couple is also very telling! I was sort of rooting against them too. I have this problem all the time. Rating is so amazingly difficult for me that I finally gave it up. Although even writing a review is a way of rating and that can be difficult and non-permanent too. I think Neil did give up something important--his ambitions may not have been as well-defined as Georgie's were, early on, but everyone has ambitions. I still have only a half-time job because of raising kids and believe me, I had much bigger ambitions than that. That's a good point. Most people at 23 don't have their lives figured out. But Georgie and Neil didn't have kids until they were 30-ish, and Neil still didn't really have a job he liked or even a path to finding something he wanted to do. I agree that doesn't mean that he should have to give up his ambitions, ambiguous as they were, but I don't think that means that he sacrificed so much more than Georgie did. After all, Georgie has stayed the bread-winner, so she gave up time with her kids to be able to do that - it's a sacrifice, too. I agree, because what a parent gives up for kids should never be a contest. I think Neil would have been on to a path with a career if he hadn't decided to marry Georgie and parent their kids.